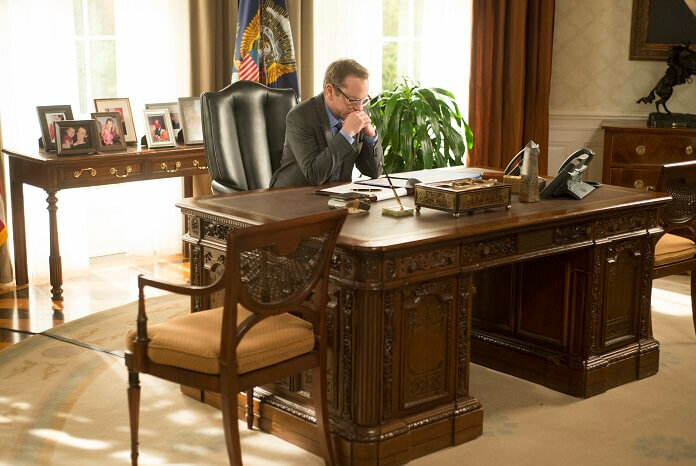 'Designated Survivor' Season 2 Episode 21 Recap and Review: "Target"
“If you really think that’s what’s best for the country, you shouldn’t be sitting in that chair,” says Cornelius Moss (Geoff Pierson). “But I am,” replies President Kirkman (Kiefer Sutherland) as he’s having Moss investigated to see if he should be prosecuted for leaking classified information in season two episode 21 of ABC’s Designated Survivor. As the episode begins, Hannah Wells (Maggie Q) goes to the house where she believes Valeria is and ends up in a fight with a guy staying there. The police arrive and arrest her for breaking and entering and assault. Over at Kendra’s (Zoe McLellan), she’s just waking up after spending the night with the President’s brother, Trey (Breckin Meyer). She’s a little embarrassed and he’s all smiles. At the White House, Kirkman meets with Emily (Italia Ricci) and Aaron (Adan Canto) about passing a bill when Boone (Paulo Costanzo) turns on the television showing Moss telling reporters he believes Kirkman isn’t fit to be President. On another channel, Ethan West (Michael J. Fox) is lying as he claims to reporters he was the one who got the kid freed from the foreign jail and Kirkman almost sabotaged it. Kirkman suggests to his staff they appoint West to investigate Moss. Kirkman meets with the Democratic senators about passing his bill. They’ll back it if he’ll stop being an independent and switch over to being a democrat. Kirkman gets fed up with them for playing politics and gets ready to meet with the republicans to help push the bill through. Trey heads back to Kendra’s house to pick up his wallet that he accidentally left behind. When he arrives, he sees her front door open and a hole in a window. He searches the house and finds Kendra hiding in the bathroom. Back at the White House, Trey and Kendra are telling the President, Ritter (LaMonica Garrett), and Detective Perreta what happened. Kirkman informs everyone he considers what happened to Kendra to be an attack against the White House which means Secret Service Agent Ritter will investigate it alongside Detective Perreta. Kirkman pulls Trey aside and, knowing that he spent the night with Kendra, reminds him it’s improper because she’s the White House legal counsel. He needs to end it. Boone meets with West to let him know he’s being appointed special investigator to look into Moss. West agrees but says he’ll only look for the truth. Aaron bails Wells out and tells her she’s being played by Valeria. He reminds her she can’t go rogue again because she’s on leave from the FBI. He also tells her she has to meet with West for the investigation. When Wells meets with West, he seems much more interested in her investigations and what she did for the President than looking into Moss. Kirkman meets with the republicans about the bill and they do exactly what the democrats did, telling him he needs to pick a side and stop being an independent. The election is 16 months away and they want to know where he stands and if he’ll run. Frustrated, Kirkman ends the meeting. Kendra’s in her office when she gets a call from a mysterious person threatening her and telling her to look into a case of an unsolved murder years ago or a broken into house will be the least of her worries. Kendra fills Ritter and the detective in on the call, and they begin to look into it. Chuck Russink (Jake Epstein) gets into his car and Wells is already in the back seat. After startling him, she says she needs a sounding board and goes over what happened at the house. Chuck points out that it’s obvious Valeria wants Wells out of the way. West meets next with Aaron to go over everything that’s happened at the White House in the last few months, especially anything involving Agent Wells. Chuck gets a call from Wells who tells him her apartment was ransacked. She knows that Valeria is after something and Chuck reminds her that all Rennett’s belongings are locked up at a secure location. Wells heads out to try to get access to Rennett’s things. Kirkman has Seth put out a press release slamming both parties for playing politics and putting their parties over doing what’s right and passing the bill. West meets with Moss who’s cool as a cucumber. Moss admits to passing along certain information but insists nothing he passed on was confidential. Afterwards, Moss meets with Kirkman and warns him that if he does try to prosecute him, he’ll lay the blame for everything on Kirkman’s shoulders. Ritter, Kendra, and the detective meet with the father of a suspect they’ve come up with looking into the unsolved murder case and believe he may be the shooter. The man tells Kendra she ruined his life and his family’s with the way she handled the case. She notices a photo of a bait and tackle store and later outside his house she and Ritter talk about how his son Mickey – their suspect – might be laying low there. Ritter and the detective go to check it out. When Ritter and the detective arrive, they see Mickey using a chainsaw cutting logs. They flash their badges and he smiles and says, “Just a minute.” He bends down, puts the chainsaw down, and rises up firing a gun at them. Mickey runs into the woods and Ritter and the detective give chase. Mickey runs out of ammo and tackles the detective. He grabs her gun and is about to shoot her when Ritter shoots Mickey. He falls to the ground, dead. Ritter and Kendra meet with Kirkman and bring him up to speed. Kendra believes the case to be closed and that Mickey blamed her for how she handled the case, broke into her home, and threatened her. Boone meets with Kirkman and advises him that it’s time for him to pick a side and to decide if he’s going to run for another term as president. Instead, Kirkman says he’ll be staying an independent and to bring in senators from both parties. Kirkman meets with the same leading senators and promises them if they do not sign off on the bill, he’ll tell the press and the public that both parties are putting partisanship over soldiers, the people, and what’s best for the country. Later, Trey admits to Tom he has real feelings for Kendra and would find any excuse to be in the same room with her. Tom believes Trey should tell Kenra what he just told him and wishes him luck. Kendra’s feeling bad about how she prosecuted the case and how it led to the family’s downfall. Emily tries to cheer her up and tells her she can crash at her place since she doesn’t want to go home. Wells meets with Aaron and pushes to get access to Rennett’s belongings. She says it’s about getting closure, and Aaron pulls a few strings and gets her five minutes. She finds a piece of paper about a rendezvous point among Rennett’s belongings and heads to the location. She sits on a bench and then examines it closer and finds a hidden flash drive. Later, she puts it in her computer and a video comes up of Rennett telling her if she’s watching this he’s probably dead. He gives her an address where he says his 16 year-old daughter is living and he’s convinced that Valeria will try to kill her. He begs Wells to keep her safe. Wells calls the airport and prepares to head to London. West meets with the President and explains that although Moss might be arrogant he sees no proof of leaking confidential information. However, he does believe Wells’ actions are suspect and there might be enough of a case to bring against Kirkman for political conspiracy. Trey visits Kendra and is happy to hear they caught the guy. He begins to tell her how much he enjoyed the other night and Kendra closes the door and apologizes to Trey. She admits she doesn’t usually date and is worried that because they moved way too fast, she ruined it. She confesses she does like him. They agree to go on an official date. Ritter rushes in and tells Kendra the killer who was put in witness protection was murdered. Mickey and his father used the whole scare tactic to flesh out the killer and murder him. Ritter says Kendra can’t go home, and Kendra remembers that Emily went to her home to pick up a few things for her while she stays with Emily. Kendra calls Emily who’s in Kendra’s house picking up her things. Emily starts to talk to Kendra when she’s shot by a sniper through a window. There was a feeling of redundancy about the episode that overwhelmed the few surprising twists. The quick and unsurprising turn of events with West turning his investigation into another witch hunt to go after Kirkman plays out like a been-there-done-that repeat episode. The reveal of Rennett having a daughter who might be in danger is really not that interesting of a storyline for Agent Wells. Perhaps the best scene in the episode is the one in which Moss and Kirkman face off and threaten to bring each other down. Even that scene, though, felt a little forced and contrived. With Emily’s fate unknown and Moss about to throw his hat in the ring to run for the Oval Office, President Kirkman has an uphill fight ahead of him. Professional film critic since 2003 and a member of the San Diego Film Critics Society. Host of “The Movie Guys” radio film review show from 2007 through 2013. Film and television critic for Showbizjunkies.com and a movie buff since 1973.